It’s hard to know where to begin when it comes to addressing the death metal pioneers, and now legends, OBITUARY. The extremely savage metallers’ origins date back over 30 years, to their beginnings as Executioner (that soon became Xecutioner) in mid-80s Florida. In the years since, they have firmly established themselves as one of underground heavy metal’s most revered, enduring acts. My first time seeing them live was in 1994 – alongside Machine Head for their own first ever tour – as both were support for Napalm Death’s ‘Fear, Emptiness, Despair‘ U.S run. I met them that night and was even invited back stage, thanks to a well admired Septic Death T-shirt. I still have some Polaroid pictures – remember those? – documenting a wonderful experience for my young metalhead self. I’d catch them live several more times over the years, during different eras and changing band memberships, with the most recent being a stop in Asheville, North Carolina this past Labor Day Weekend. This latest event was at the inaugural launch of the Heavy Mountain Music & Beer Festival. More precisely, Day 2, at The Orange Peel, where they would share the stage with High On Fire, Black Tusk, Inter Arma, Exmortus, and Young Widows. It also served as the second stop of OBITUARY‘s own, recently launched “Redneck Run 2 Tour“. September 2nd would deliver an incredible experience for me personally, and one that we here at Riff Relevant now share with you. 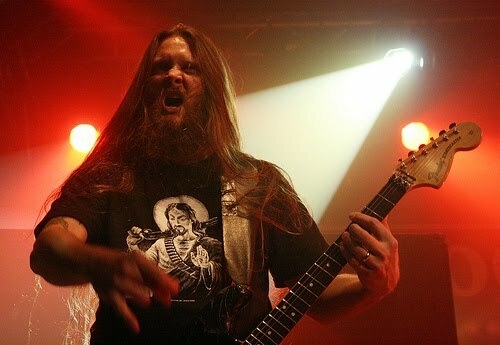 I was able to speak with longtime OBITUARY guitarist Trevor Peres on camera*, and he more than graciously tolerated my fanboy-ish glee and elation at our being there. We discussed myriad things including various aspects of OBITUARY of course, as well as his involvement in the early 90’s industrial metal side project, MEATHOOK SEED (which included Napalm Death’s Mick Harris and Trevor’s own band mate, drummer Donald Tardy). Also mentioned in the exchange is a bit of news about Trevor having released a line of BBQ Sauces, using a nickname – T-Bone – bestowed upon him by the Agnostic Front guys. Find out more about T-Bone’s Famous Smokin’ BBQ – who also operate a food truck – right HERE. RIFF RELEVANT INTERVIEWS: OBITUARY’s TREVOR PERES!